When a commuter discovers a mutilated corpse on the Prague Metro, Captain Jiri Hofschnadir of the Criminal Police is called in to investigate. Meanwhile, in Hong Kong, newly-weds ex British cop Lawrence James and forensic psychologist, Jessie Sandersen are on honeymoon after their frantic efforts to capture the Australian serial killer known as The Dingo. But wherever James and Sandersen go, trouble is never far behind. As the body count rises in Prague, Sandersen is called in to help track down the serial killer dubbed The Dark Angel. In a game of cat and mouse, James and Sandersen will be pushed to their very limits. But can they catch The Dark Angel before it’s too late? This book finds newly weds James and Sanderson globe trotting again in the hunt for the bad guys that just have that superior edge. The real serious killer that has developed from random kills to precise and precision planning that always puts them one step out in front. 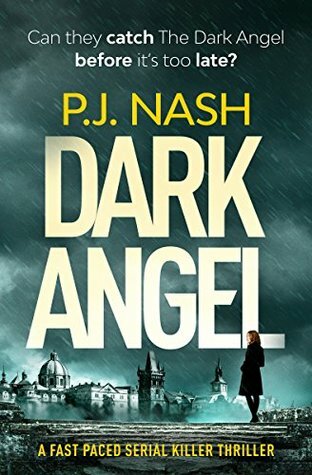 In Prague British men at being targeted by a killer that has earned herself the nick name of Dark Angel. Well dark she certainly is, angel definitely not. The kills are gruesomely described with the bodies displayed to show their shame because in the mind of this killer they are all guilty of the crime that was committed on her years before. The chapters are short and snappy jumping to different scenes, different countries and new victims as the killer becomes more daring. Boy there are one or too scary chapters that I thought could bring this to a pretty short series. P.J. Nash certainly has that ruthless streak in his writing that makes you feel like no-one is safe. It does make for pure tense unpredictable heart in your mouth scenes though with a relative shortish novel one that I whizzed through and did a head count at the end. I am really enjoying this series which for me is finding its own little niche in the psycho crime genre. Bring it on Mr. Nash!